Mo Alie-Cox (left) provided 18 points and eight rebounds as VCU knocked off regular season champion Davidson 93-73 in the A-10 semifinals. BROOKLYN, N.Y. – Momentum is a funny, nebulous concept, but if there was ever proof of how quickly it can shift, it was VCU’s impressive – and for many, unexpected – 93-73 upset of regular season champ Davidson Saturday in the Atlantic 10 Tournament semifinals at Barclays Center. Left for dead a little over a week ago by some prognosticators, VCU is back to wreaking havoc on brackets. The Rams are storming into the A-10 title game for the third straight year Sunday, where they’ll take on Dayton. The Flyers topped Rhode Island in Saturday’s semifinal nightcap. It will be VCU’s fifth straight appearance in a conference championship game. Just days ago, VCU’s victory would have been considered as unlikely as a Knicks winning streak. At times, the Rams made it look easy against Davidson, hitting 12 three-pointers on the way to victory. The Rams didn’t just beat a red-hot Davidson team Saturday, avenging an 82-55 blowout loss on March 5, VCU dominated the Wildcats for long stretches, and displayed championship form. It was Davidson’s first loss in 11 games, and VCU’s best performance since losing point guard Briante Weber to injury on Jan. 31. VCU’s 93 points were the most by a Davidson opponent in three months. “We played with a lot of enthusiasm today. We wanted to go out there and attack from the get-go. We had our ups and downs and responded pretty well today, and we’re going to have to do that for the rest of the season,” said senior Treveon Graham, who finished with 18 points. It had been nine days since VCU and Davidson last met, but it might as well have been nine years. In the meeting at Davidson’s Belk Arena, the Wildcats summarily thumped VCU from the opening tip to the final horn. The 82-55 loss was VCU’s third straight at the time and the worst of the season. It also helped propel Davidson to the A-10 regular season title. As the Wildcats were surging, VCU appeared to be headed in the opposite direction. The defeat capped VCU’s first three-game losing streak since the 2005-06 season and triggered some soul-searching in the Rams’ lockerroom. Without the dynamic Weber, the Rams struggled to find an identity. Following the Davidson loss, it was his replacement, JeQuan Lewis, that helped VCU start to pick up the pieces. Senior Treveon Graham scored 18 points and hit 4-of-4 three-pointers Saturday. Now, the Rams will play for a championship. 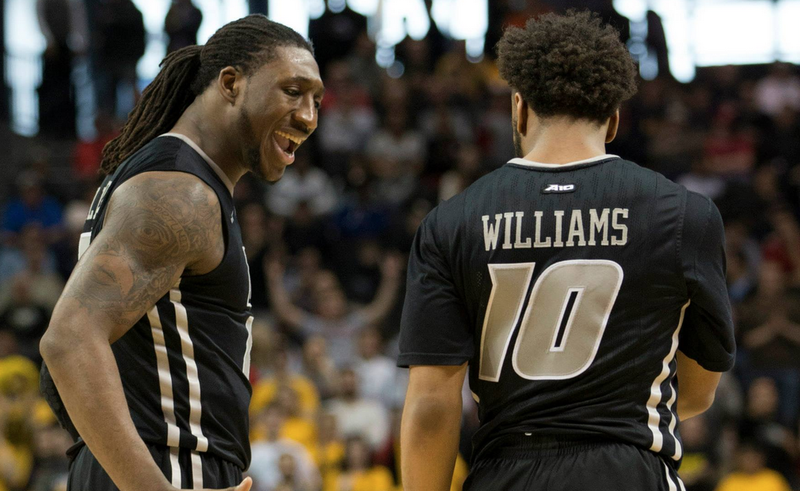 In the wake of that loss, VCU slowly began to find itself with three straight wins. But it was nothing like Saturday’s breakout effort. VCU came in with clear motivation. For nine days, that blowout lingered. The game certainly didn’t seem to be headed in that direction in the early moments. Much like it did nine days ago at home, Davidson raced out to a big early lead at 16-4. Nine days ago, VCU never did find an answer. This time, the Rams responded with one of the season’s most emphatic counter punches. VCU used a stunning 40-12 blitz the final 12 minutes of the first half to take a 44-28 halftime lead. Davidson, which opened the game by hitting six of its first nine shots, succumbed to VCU’s pressure and watched as the Rams found comfort in the open floor. The Rams hit 8-of-14 threes in the opening half. Meanwhile, Davidson closed the period with 5-of-20 shooting. It wasn’t just outside shooting. While VCU has found its outside stroke in this tournament, it also got a career-high 18 points and eight rebounds from Alie-Cox down low. Seven of his rebounds came on the offensive end as he used his 6-foot-6, 250-pound frame to outmuscle Davidson’s Peyton Aldridge and Andrew McAuliffe around the basket. Alie-Cox’s production was in stark contrast to his nine-point, four-rebound line in the last meeting. 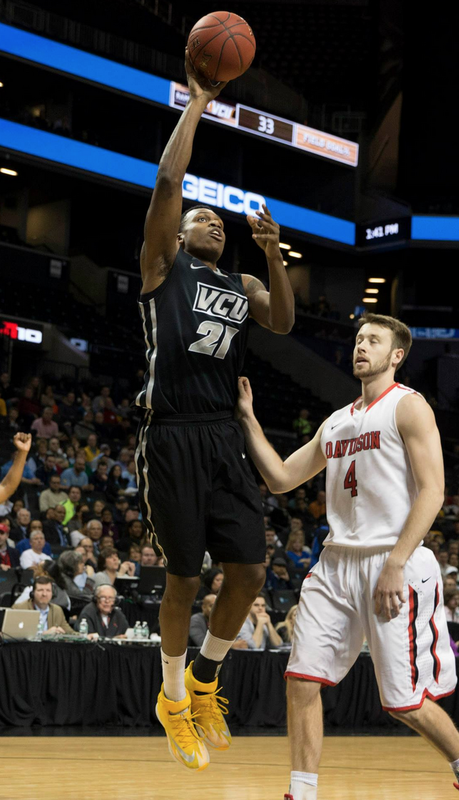 Despite VCU’s first-half salvo, Davidson did not go quietly. The Wildcats, who overcame an 18-point deficit to beat La Salle on Friday, trailed by as much as 22 before they put together a blistering 16-0 second-half run and closed within 57-52 with 10:18 left. But the Rams had more than one big response in them Saturday. Freshman point guard Jonathan Williams hit a pull-up jumper in the lane and found Alie-Cox with a zone-busting bounce pass for a dunk a possession later to spark a 10-0 VCU run. The Wildcats could get no closer than 11 the rest of the way as VCU, which came into the game shooting 64 percent at the free throw line this year, hit 18-of-20 free throws in the final 7:57. “I think we played with much better energy. We defended their motion much better,” Smart said. “We were certainly far from perfect, but Davidson is a team, if you’re just a half-step off defending their motion, they make you pay and make you look really bad, and they did that to us nine days ago. Way to go VCU! Now bring home the trophy!